After Birthing Pod was banned, I sold most of my Modern collection. I wasn’t even a Pod player, but I lost a lot of confidence in putting resources into the format, especially since I don’t play a lot of paper Magic these days, meaning my cards weren’t even being used. It wasn’t just the banning, though. By that time, Modern Masters 2015 had been announced, and it was clear to me that if I wasn’t using these cards and they were likely to be reprinted soon, I should probably get what I could for them while I could. 1. Did get reprinted, but I didn’t sell. 2. Did not get reprinted, and I didn’t sell. 3. Did get reprinted, and I did sell. 4. Did not get reprinted, but I did sell. As I often do, I’m drawing some examples from personal experience, but am also looking for overarching themes and lessons we can all learn from moving forward. The main reason I didn’t sell these cards is because I got in cheap, but there are other factors, too. 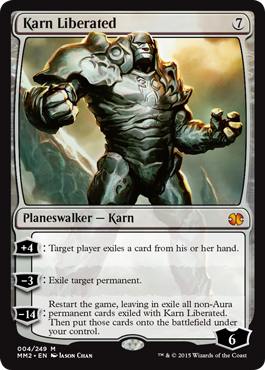 When Karn rotated from Standard, I traded for three copies at $15 each (how I wish I could say it was 30 copies…). One of those has since been traded out, but the other two reside in my cube and my Maelstrom Wanderer Commander deck. Is the retail price of Karn likely to drop below the $15 point where I previously acquired these? If I buylist these out for $35 right now, that represents $20 profit. Am I likely to be able to purchase reprinted Karns for $20 or less? Do I want to go through the effort of trading these away and then trading back for them after a reprint? Do I want to play with a cube or a Maelstrom Wanderer deck that lacks Karn? The answer to each of these questions is a solid no in my mind, so I kept my Karns. I employed the same logic to my playset of Cryptic Command, which I acquired (shortly after Modern Masters was released) in slightly played condition for $70 and a Deathrite Shaman. In Cryptic’s case, I was not as sure that it would see another reprint, but I figured that even if it did, I probably would not be able to beat that deal (they are Lorwyn version, too). Since I’m not currently using the full playset, though, I mitigated my risk by trading out one copy at its peak. As of now, I don’t really have any regrets about trading that one or not trading the others. We’ll see if some other factor changes that. Overarching Strategy: Consider the price you got in at, the profit you could make, what you expect the post-reprint price to be, how much you risk you’re willing to take, how much use the cards are currently getting, and any other relevant factors to determine if you should sell a card you anticipate is getting a reprint soon. 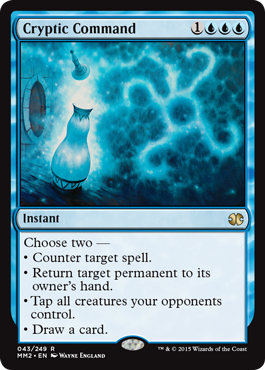 I admit, I was skeptical of everybody immediately assuming that Innistrad was not included in Modern Masters 2015. 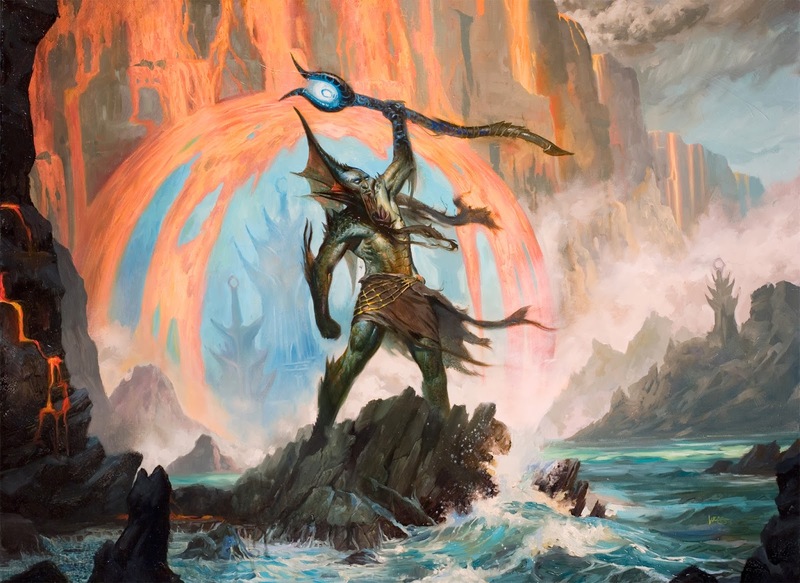 The text in the original announcement was vague, stating, “Modern Masters 2015 Edition takes players back to some of the most remarkable planes from recent history, including Zendikar, Mirrodin, Ravnica, Lorwyn, Kamigawa, and Alara.” By contrast, the first Modern Masters announcement set a very specific range: “Cards are reprints from Eighth Edition through Alara Reborn.” I don’t think I was wrong to think Innistrad cards might be included, but luckily for me, I eventually got on board with what the community at large. As a result, I didn’t sell my Snapcaster Mages (thank heaven, it’s nearly doubled in the last six months) or Geists of Saint Traft (I don’t own Lilianas). But Innistrad cards were easy. Other than Innistrad cards, the main category of cards I held onto were lands. 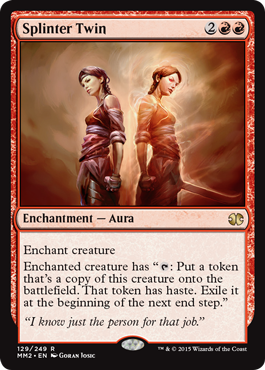 The first Modern Masters didn’t have a cycle of rare duals, and while it was certainly possible for Modern Masters 2015, seeing fetches in Khans made me feel basically safe holding everything I owned. So I did, and none of it got reprinted. Phew. Overarching Strategy: Consider the information that is official, compare it to past situations that are similar, listen to trusted community members, and draw your conclusions. Just like you shouldn’t marry the first pick of your draft, though, you shouldn’t cling to your early conclusions just because. If I had stuck with my immediate thoughts regarding Innistrad‘s inclusion, I would have sold off my Snapcasters and Geists for a (relative) pittance and would now be looking at sharply increased prices should I be wanting to reacquire. This is, of course, where I was hoping to be most successful, and I did okay. Each of these cards was pretty obviously going to be targeted for reprint, and although I could see a world where Wizards would print these at mythic, their earlier rare printings suggested otherwise. The nice thing is that I got great deals on each of these cards, too: each was acquired at 10 to 25 percent of its current retail price. However, Cryptic Command aside, a reprint at rare does a lot more to crash a card’s value than a reprint at mythic, and I wanted to make sure I locked in profit on these while I could. 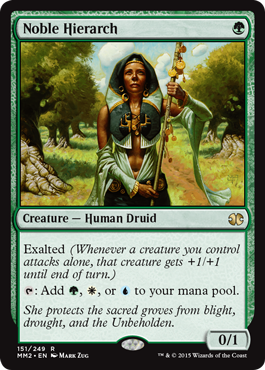 I did keep a single Splinter Twin and a single Spellskite for my cube, but Noble Hierarch got proxied—I’m not playing a $70 mana elf in a casual format when I could triple up instead. Good thing, too, because it’s already down to $50. Expect it to drop more. Then we have commons, uncommons, and casual rares, which I anticipated would just get wrecked, even compared to the above three cards. In this case, I sold off my Smash to Smithereens (reprinted at common and has already dipped from $5 below $3), Remands (keeping a couple for Cube and Tiny Leaders, because this is honestly one of my favorite cards), and Mirran Crusaders (which I still had around from Standard rotation and clearly weren’t going anywhere). I feel quite good about selling these. 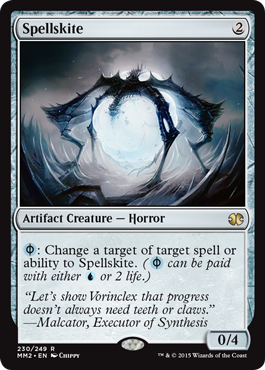 Remember what happened to Spell Snare after the first Modern Masters? Overarching Strategy: Of the cards you most expect to get reprinted, consider which ones are most likely to get hit hardest. Those are the ones you should most prioritize trading or selling, as you want to lock in any profits (or minimize any losses) as soon as possible. It’s important to note that if I had been actively playing Splinter Twin in Modern tournaments, I would have eaten the anticipated loss and kept them. It really all comes down to how much use the cards are seeing versus how much money you expect to lose based on the reprint. I always knew this would be the most painful category, once I could identify the cards that were in it. I traded out my last set of Serum Visions, and I’m still having a hard time believing it’s not in the set. Again, though, I’m not playing Modern right now, and Visions is only good in that format, so I’m not feeling too much regret. The best part? I pulled three or four sets out of five-cent bulk bins back in the Avacyn Restored days, so I made plenty of profit off of this card. I can always rebuy for the stupid $10 price if I feel the need. Inkmoth Nexus is where most of my regret lies. I got in on about 10 or 15 copies of this at $5 or $6 each a while back, and had been anxiously watching for it to go up ever since. This seemed like a likely include for this set, given Infect’s perpetual-if-not-dominating presence in the Modern metagame, but a reprint was not to be. Now Inkmoth is sitting at a retail price of $20, while I’ve sent all my copies out on PucaTrade for 1000 to 1200 points. If Infect wins an event or two in the next year, I expect it to go up even more. Overarching Strategy: Considering this is the “screw-up” category, maybe it’s not wise to recommend anything here? Then again, it’s not like I lost money on my Inkmoths or Visions. I don’t mind a cautious approach, and I don’t think you should, either. You know what? I feel like I made a lot of good calls in anticipation of Modern Masters 2015, and even if my decisions regarding Serum Visions and Inkmoth Nexus were ultimately incorrect (and disappointing in hindsight), I don’t think my thought processes were wrong, nor do I regret taking a cautious approach. I locked in value on all kinds of cards that got reprinted, successfully managed to not fire-sell cards that I want to own and don’t believe will lose anything on, and correctly identified cards that were not at all likely to be reprinted. There are too many variables to say how much money I “made” or “saved,” but I know that it’s more than what I “lost” by selling my Inkmoths and Visions for a smaller profit than I might have otherwise gotten. So what are the big lessons here? 1. Think things through critically. 2. Have a reason for each of your decisions. 3. Don’t second-guess incorrect decisions that were made for the right reasons. 4. Don’t dwell on decisions that didn’t work out, especially if you made a bunch of decisions that did! 5. I made a lot of presumptions in making these decisions, and you know what happens when you presume, right? 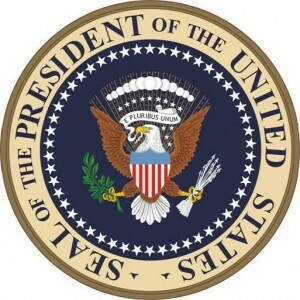 It makes a pres(ident) out of (yo)u and me! Yep, I’m pretty sure how that’s how the saying goes. Presume away, folks. That’s it for this week. Have questions or comments? You know what to do.